The Webb Bridge in Melbourne is the last pedestrian bridge over the Yarra River as part of a public art project in Melbourne's Docklands area. It was created by Denton, Corker & Marshall (DCM) in collaboration with artist Robert Owen, a distinguished Melbourne artist. The design received first prize in a limited design competition. The brief called for the re-use of the remaining sections of the Webb Dock Rail Bridge, in order to link the Docklands on the north side to the new residential developments on the south side. This image belongs to the travel and nature stock photo library. This stock photo of Webb Bridge at Sunset is available for licensing for commercial and editorial uses including websites, blogs, books, magazines, brochures and advertising. Restrictions may apply for images which contain third party copyrighted material or sensitive subjects. Photos of artwork are for editorial use only. 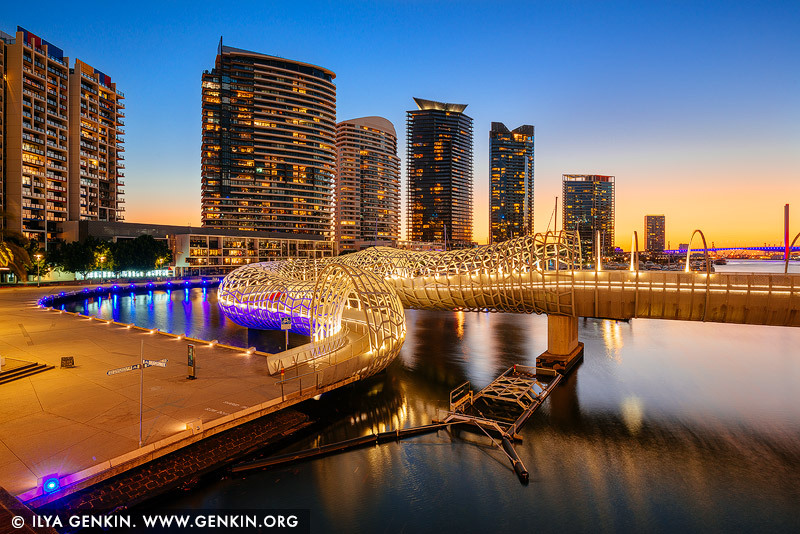 This image id AU-MELBOURNE-0022 of Webb Bridge at Sunset, is copyrighted © by Ilya Genkin. This is not a public domain image.